Joy – It Leads to Organizational Resilience! When people are fulfilled by their work, they experience joy! When the organization culture includes personnel development and involvement, joy is a frequent occurrence. In a recent speech I described the gray line between work and play. Humans are the only species that seeks happiness. And the ultimate goal, the peak of happiness, is joy. Poets talk about “Joi de vivre” – the Joy of living. According to polls, the most popular and beloved of all classical music compositions is Beethoven’s “Ode to Joy”. I ended my 2014 book, “The DNA of the Resilient Organization – How One Collective Heartbeat Creates Continuous Competitive Advantage”, with a discussion of Joy in the workplace. I have found that organizations that achieve internal organization unity frequently and regularly experience joy. And the greater the unity, the greater the organization resilience. It is circular. Joy should be the goal of not just play but also of work! Both Play and Work can and should be a great source of Joy! You can’t sustain health – in mind, in body, or in any organizational body – without joy. When joy goes, health also deteriorates. True unity, which is accomplished while building organizational resilience and sustainability, leads to joy. The greater the unity, the greater the joy, and the greater the organizational resilience. I was amazed to hear Stephen Covey’s presentation on “The Speed of Trust” at NASBA’s (National Association of State Boards of Accountancy) annual conference for national and international accounting regulators. It focused on the same concepts I developed over the last two decades which have brought me a lot of attention, but I didn’t know why. After hearing Covey’s presentation, I finally know why! Covey’s presentation echoed the themes of an article I wrote in 2003, which were further developed in my recent book. The article, “How to Implement Change Effectively”, was originally published in the Journal of Corporate Accounting & Finance (John Wiley & Sons). Wiley & Sons editors suggested I write a book expanding on the article. The core themes of Trust and Collaboration, Transparency and Linking were the centerpiece of my subsequent book, “The DNA of the Resilient Organization – How One Collective Heartbeat Creates Continuous Competitive Advantage”. Published in late 2014, the book includes the strategies and steps needed to build long term resilience. And now, 15 years after the initial article, Stephen Covey promotes these same core concepts! In 2015, the 2003 article was selected as one of the Top Ten Articles of All-Time published in the Journal! The selection criteria were: “frequency of access by readers” and “enduring usefulness of content.” It was featured on the cover of the special issue of the Journal, “Best of JCAF” May/June 2015 Issue , in the #1 position. Amazing! After hearing Stephen’s presentation, I now understand why the article received so much attention. For organizational health and success, these concepts are the only Magic Bullet. They are the centerpiece of all good organizational change strategies. Collaboration, Transparency and Linking are essential but they can’t be successfully implemented without developing and embedding Trust as the centerpiece of the culture. “Millenials value open, transparent, collaborative leadership style. Trust leads to Joy!” All these are themes from my award-winning article and in The DNA of the Resilient Organization. Trust is an economic driver, not just a social virtue. Trust is the #1 competency of leadership needed today – the ability is critical to every other factor. A culture of Trust and what it enables — true, open collaboration and communication, creativity, and risk-taking — builds strong, innovative and resilient organizations! My Rajneeshee Experience – Leadership Run Amok! With the resurgence of the Oregon Rajneeshee story in national and local documentary films, it’s time to reshare the negative lesson in leadership I learned from working with this fascinating client over 30 years ago. The lesson is as useful today as it was then. My original Blog post is below, slightly expanded. This documentary was an accurate portrayal of the story, from my early knowledge of the Rajneeshees. I didn’t know many of the events of the last three years of their existence. My CPA firm had stopped providing services to them by then. We sensed the change in behavior long before the rest of the Oregon community did. We were long gone and one of the international CPA firm giants was doing their work. We knew only the glory years, the glorious reclaiming of the land and building of the amazing city in the desert. The over-farmed, starved land they encountered is so rich today because of all the money they plowed into it then. My firm was asked to provide audit services for their corporation. Although skeptical about this commune, after due diligence research (with the former Mayor and their New Jersey CPA) we took them on as a client just as they moved to Oregon. I came to trust them; they wanted to disclose everything required by accounting reporting standards – and more. They waived our professional confidentiality commitment to them; they wanted everyone to know more about them. They wanted to be trusted and respected by Oregonians. Rajneeshee leaders hired the best service providers in Oregon – attorneys, engineers, environmental scientists, agriculture specialists and more – to help them build something wonderful and good. The Rajneeshees I met (former doctors, attorneys, accountants, religious, business owners, teachers, musicians), well-educated and savvy, had one thing in common. They were searching for “truth”, their purpose in life, their reason for being. The final implosion was a classic example of leadership run amok. The adage “power corrupts” was true here; they soon became a divided leadership group. The structure of Rajneeshpuram, with absolute power at the top and few others involved in decision-making, enabled the tragedy. The great spiritual leader was shielded (kept away) from the decision making. Faced with legal and political challenges from the local community outside and also with internal strife, top leaders became combative rather than collaborative. They chose confrontation over reason and compromise. They chose to protect their own personal positions, without regard for law, morality, or for the good of their own community. The Vision was corrupted. For the full fascinating story see “Utopia and Bureaucracy: The Fall of Rajneeshpuram, Oregon” by Carl Abbott, Portland State University. The Northwest Commission on Colleges and Universities (NWCCU) recently appointed me to their Board of Commissioners. The NWCCU is one of seven regional commissions that oversee the accreditation process of higher education institutions “to assure quality and spur ongoing improvement”. It is a great honor, a new challenge, a wonderful opportunity for me to learn lots while helping improve our U.S. higher education system! This peer review system, over 100 years old, defines and evaluates whether institutions meet high standards. The NWCCU has over 200 volunteer professors and administrators who carry out the institutional reviews and present their recommendations on each institution to the Board of Commissioners for review and approval. The Northwest Commission oversees 162 colleges and universities in 7 western states (Oregon, Washington, Idaho, Alaska, Montana, Utah, Nevada) and British Columbia. The Board of Commissioners currently has 19 members: seventeen educator Presidents/leaders and two representatives of the public (including me). Regional accreditation bodies authorize funding by the Federal Student Financial Aid, and therefore must be reviewed and recognized by the U.S. Department of Education. In reviewing my Blogs, I noticed that my post on Communication remains the most read, by a large margin, of all my Blogs. It has been read in over 90 countries. Here it is again for those who haven’t seen it or for those who might enjoy reading it again! I hope these ideas lead to a happier, more fulfilling environment in your homes and workplaces and to much greater, more sustainable success! Two major life events have consumed and defined my year 2014: completion of The DNA of the Resilient Organization and the passing of my father, Robert Joseph Van Handel. They are surely the heaviest impact events of my life. In working on both areas today, I was hit by the realization that the most important factor in achieving success in both our personal and work lives is Communication. How many people, in realizing that they are coming to the end of their lives, contemplate the relationships that could have been more fruitful and more joyous if they had taken more steps to improve Communication? Most, if not all, I am sure. My Dad certainly did. As his eldest and the one closest to him geographically and emotionally in both early and late years, I was privileged to hear and to understand that about him. He had great regrets. As the confidante of hundreds of leaders and observer of their companies, I can attest to the heavy impact and needless damage caused by insufficient and ineffective communication among leaders and with their troops. Most leaders don’t see the cause of their internal problems as inadequate communication. In The DNA of the Resilient Organization, I describe the Barriers to Successful Change. They are ALL related to ineffective communication. 1. People aren’t listened to (or perceive they aren’t). 2. People from diverse levels and related groups aren’t sufficiently involved in planning. 3. People don’t trust one another – because leaders don’t sufficiently exercise or promote open communication and sharing. 4. People are afraid of failure because penalties for failing are greater than the rewards for taking risk. Those same barriers get in the way of good family relationships and lead to unresolved family differences, jealousies, and walls between one another. The greatest loss from lack of interpersonal, proactive (even occasionally confrontational) communication in both our home and work lives is the inability to build environments of joy. Effective communication leads to a happier, more fulfilling environment in homes and in workplaces. 2015 was a phenomenal year for me, a year of life accomplishments and awards. When a year like this occurs, what does it mean and how do we respond? I believe it is important to share our journey with the people we touch. We can inspire them to greater hope and faith whatever their current situation may be. Rewards for hard work and faith do come if we focus on goals and on our greater purpose. Teaching second year graduate students at Willamette University’s Atkinson Graduate School of Management was one of the most joyful, gratifying experiences of my life. The students were wonderful and the work was a stimulating challenge. The semester of teaching was also one of the most all-consuming, relentless-focus experiences of my life! One student summarized the course with a central sentence from the book: “Successfully and sustainably accomplishing organizational change is simple – build both Ability and Desire at the same time.” The University said that my unique accomplishment with the book was that it linked two disciplines: Organization Development and Risk Management. My second major event of 2015 was a huge surprise. My 2003 article, “How to Effectively Implement Change”, was chosen by the Journal of Corporate Accounting and Finance as one of the “Top Articles of All-Time” in their 30 years of publishing. The Journal featured the article again in their “Best of” May/June 2015 Edition – #1 on the cover. The JCAF is a juried professional publication, available by subscription only. Selection of the best articles was by their Editorial Board of leaders representing national corporations, universities and libraries. Selection of my article was based on two criteria: 1) Enduring usefulness and 2) Most accessed online. 3. The third 2015 honor/accomplishment was receiving the Federal Reserve Bank of San Francisco award: “The Ray Dezember Award for Epitomizing the Meaning of the Fed Family.” This was especially meaningful because Ray Dezember was a friend and director of the Federal Reserve Bank from Bakersfield, the honor was given at the annual “Fed Family” meeting in San Francisco, and it was a big surprise! So, my question was, what do I do with phenomenal gifts like these? How can I thank God for these incredibly wonderful events that happened all within one year? I know the answer should be “Share” but the follow-on question is “How”? The answer came recently with an invitation received only 10 hours before an Oregon Christian Chamber of Commerce event. I immediately accepted, partially because of the topic: Passion Drives Business: Inspiring Employees and Fostering Consumer Loyalty. Justine’s message was that we can thank God and simultaneously achieve greater success and fulfillment for ourselves, our people, and our organization by sharing our unique gifts. We frequently find our uniqueness after periods of great trial, times when we are “crippled” in some way by devastating events: financial, family tragedy, debilitating illness or injury. To use Justine’s words, really tough times “turn us inside out.” We then have two possible reactions: 1) Give up and retreat or, as Winston Churchill said, we can 2) “Never, never, ever, ever, ever give up”. We can keep going, step by step, and use the devastation to find our unique strengths and gifts. As that occurs, we build great personal passion which can inspire all those around us and lead to success we never imagined in directions we could never have anticipated. These people found their uniqueness and took their organizations to new heights as a result of challenging life events. They gained personal strength in tough times and developed their own unique direction, which resulted in great success for themselves and their organizations. I certainly have found that an attitude of Gratitude and Hope, especially when going through tough times, will guide you to your unique self. Utilizing your unique gifts for greater good is the best way to thank God, to become more resilient, and to achieve true Joy. I learned today that Beethoven wrote his immensely successful Ninth Symphony to convince people that the only way to Joy is through unity. In writing it, he became so absorbed and then personally infected that by the time he and, ultimately, his audience came to the “Ode to Joy”, they were consumed by it. Beethoven read Friedrich Schiller’s “Ode to Joy” poem and started setting it to music in 1793 when he was only 22. He returned to his “Ode to Joy” themes numerous times over his lifetime but did not complete a piece of music on it until he was commissioned to write the Ninth Symphony in 1822. He wanted to introduce the human voice to this special symphony about Joy and became the first classical composer to include a chorus and soloists within a symphony. The Ninth Symphony intended to reflect Schiller’s themes about human conflict resolved by unity. The Symphony’s fourth, “Ode to Joy”, movement begins with outrage and tumult, then restates themes from the first three movements, but interrupted and rejected – signifying conflict. A new theme is introduced, is slowly accepted, and ends with a triumphant statement of the new theme. Human voices are introduced to sing the new theme, “O friends, not these tones. Instead, let us sing more pleasing and joyful ones.” Beethoven’s objective was to display two concepts: the universal brotherhood of man through joy, and love of the heavenly father. Without knowing the Beethoven story behind the Ninth Symphony, Joy is also how I ended my recent book about the concepts and strategies for sustainably achieving organization change, The DNA of the Resilient Organization. When I began writing the final chapter, I recalled that when organizations achieved the higher levels of unity that lead to greater Resilience, they also reached high levels of organizational Joy. I realized that unity and joy are linked. That is the surprise and wonderful result of working towards unity/resilience! “By now, you should understand that Resilience = Unity . . . And that true unity leads to joy. The greater the unity, the greater the resilience. . .
“Unity, a collective heartbeat, is achieved with organizational wisdom and strength. The greater the collective Wisdom and Strength, the more likely the entity is to achieve a collective heartbeat, as . . . winning teams . . . all demonstrate. 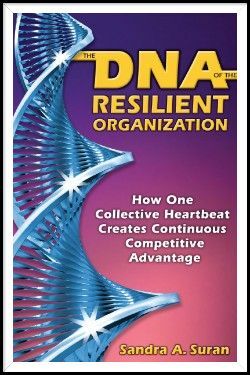 Excerpts from Chapter 10, The DNA of the Resilient Organization – How One Collective Heartbeat Creates Continuous Competitive Advantage. Another New Role — University Professor!